Filled with our favorite and most popular super extra-large Virginia peanut recipes - this cleverly shaped gift is sure to have everyone talking. Includes our 9oz. Salted Virginia Peanuts, 9oz. Redskin Virginia Peanuts, 9oz. Cajun Virginia Peanuts and 9oz. Hickory Smoked Virginia Peanuts. OU Kosher Certified. Dimension of the box is approximately 11.5"H x 8"L x 4"W. Shelf life is approximately 1 year. 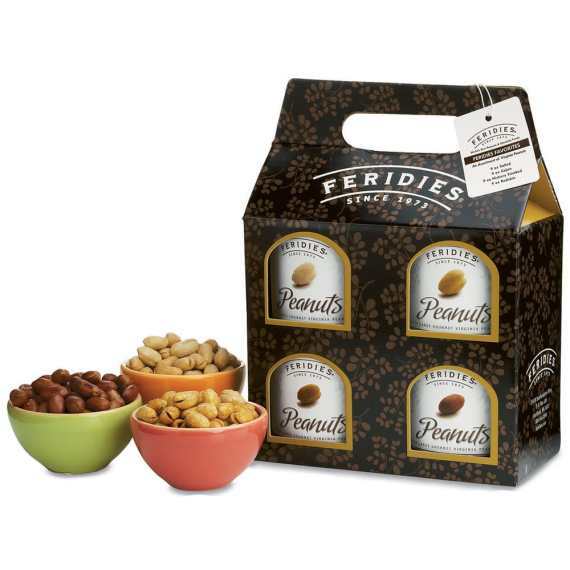 This is a great set, especially for a family who each has a different favorite nut treat.